A Mum has spoken of her family’s despair at having their dog stolen just metres from her house in Thornbury, nr Bristol, Gloucestershire. Layc Guille is appealing for information about the whereabouts of her dog, Izzie, who was taken last week. 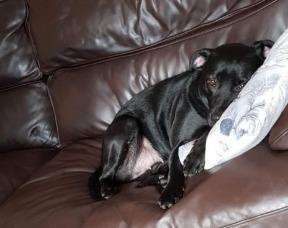 Izzie, a black Labrador-Staffordshire bull terrier cross was taken from Eastbury Close at around 2.50pm on Thursday, January 17. Layc’s partner, Zorron Webber, was out taking Izzie for one of her daily walks when she disappeared. Izzie was off her lead and ran over to bushes round the corner, failing to return when called. By the time Zorron got round the corner there was no sign of her. He looked up just in time to see a rusty white van turning the corner at the bottom of the road and then found Izzie’s collar on the ground. “Izzie doesn’t need to go on a lead because she is never out of our sight and would never run off,” Layc said. “She is a very lovable dog. She’s been treated like our third baby and is spoilt rotten. “She didn’t know how to growl when we first got her so I used to have to try to teach her. “I come from a very large family where almost all of them have a dog of some kind. Now seven years old, Izzie is one of the most famous dogs in the area, with hundreds of people helping to try and find her. A Facebook group called Help Bring Izzie Home has been joined by more than 500 people since it was created on Saturday. Searches have been carried out and posters now cover the town and surrounding areas. Layc said she had been overwhelmed by the response from the community. “Even if we don’t get her back we could never thank anyone enough, if I could give every person who’s shared it a hug I would. “But we won’t give up. I will find her I don’t care how long it takes,” she said. A £1,000 reward has been offered for information leading to Izzie’s safe return, with the family putting up money they had saved for a holiday. “We’re not wealthy. We’ve now had to cancel our holiday and tell the kids that we can’t go again this year. We didn’t go last year because of money but saved to go away this year.” said Layc. “You have ripped my family apart we don’t even want to go home. “Seeing her bed, bowls and half chewed bones is killing us. “If someone out there does know something, please have the heart to give her back,” Layc said. Anyone able to help should contact Avon and Somerset Police on 101, giving the call handler the reference number 5219011898. You can also contact the independent charity Crimestoppers 100 per cent anonymously on 0800 555 111.